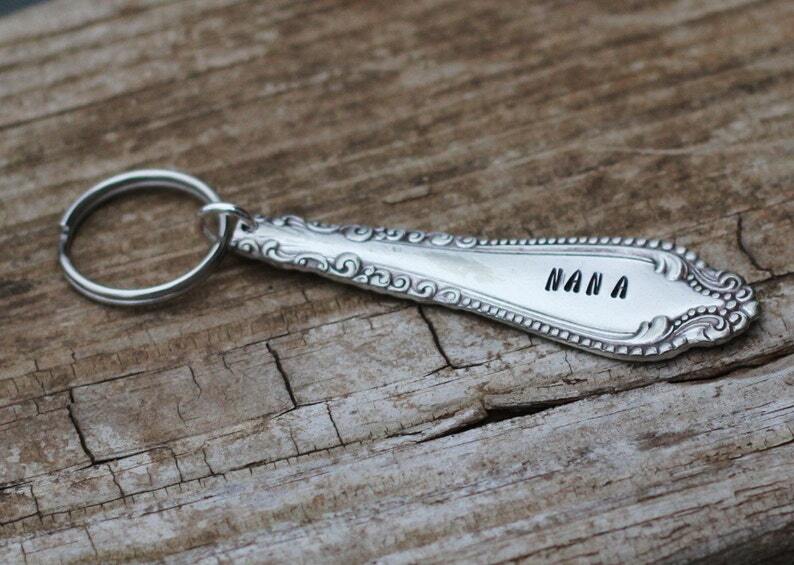 Granny, G-Ma, Nana, Gammy, Grammy, etc..
You will receive a random spoon handle hand stamped with your choice of word. Leave me a note at checkout with the word you want- not leaving a name will delay your order. Spoon handle is appx 2- 3"
These are made one at a time and will each look different. Expect some slight variations,letters do not always line up perfectly, etc.. I only use vintage silver plate utensils which show signs of wear, small scratched, and dings. Each piece has seen many meals but I do take care to select the best ones for you to enjoy. Personalized Key Chain Production time is 1-5 business days. Ordered two of these in a hurry as last-minute gifts and cannot say enough amazing things about this seller! She was super responsive and amazingly willing to accommodate a rush order - she even sent me pictures of her progress to check that the font and letter positioning was what I wanted. That’s service!